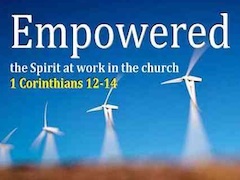 Here is an excellent sermon series covering 1 Corinthians 12-14 from Grace Church, Frisco, Texas. This entry was posted in 1 Corinthians 12, 1 Corinthians 13, 1 Corinthians 14, body of Christ, sermons. Bookmark the permalink.